enter the time of year when we all have a large zucchini sitting on our counter. the days roll by… you look at it… ‘tomorrow morning’ you think… then tomorrow morning you remember you need to be at the dentist for that cleaning you’ve put off. you again exchange glances with said zucchini… ‘cut me up’ he says… ‘prepare me in some fabulous manner’… you promise to meet his requests… ok tomorrow for sure you mumble. finally, two days later, at 2pm, you got rained out at the pool, and the kids are playing nicely in a room across the house… the planets are lining up… ok Mr. zucchini… it’s show time. this soup is the perfect way to turn Mr. Large and in charge into something different and wonderful. think beyond two loaves of zucchini bread for a moment. think even beyond everyone’s new fave, Chocolate Chip zucchini bread… think SOUP. at this time of year, our other bountiful friend is the basil plant. this soup combines the two in an almost effortless manner. this soup manages to be rich and velvety without the addition of cream. even without the addition of chicken broth, amazingly. 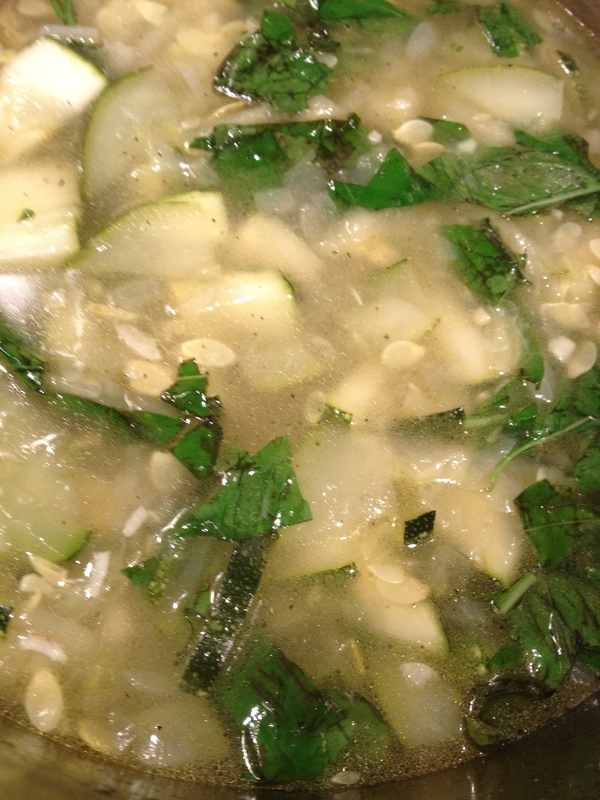 there are seven ingredients… zucchini, basil, onion, garlic, olive oil, salt and pepper. it can’t get more basic than that. this is kind of the poster child for simple cooking. whole ingredients each taking center stage in the taste. I challenge you when you are eating this to try and taste each ingredient’s flavor one by one. you WILL. I promise. enjoy. In a large saucepan or dutch oven, add 1/4 cup of olive oil. do not begin heating yet… prep your ingred’s first. lob both ends off of the zuke. cut it in half, lengthwise, and then dice both halves. doing it this way gives you a nice flat bottom on both pieces so it is not rolling around on you. large dice is ok, you will be cooking it and pureeing it at end. set aside. dice your onion and your garlic. prepare your basil, washing and roughly chopping or ripping it up. set aside. ok, turn on the heat, medium high. once warm, add your onions and garlic. sauté for five minutes stirring occasionally. add your zucchini (all of it). sauté five more minutes, stirring occasionally and adding your salt and pepper during this sauté. add you water. bring just to a boil and then reduce heat to simmer. simmer uncovered for 15-17 minutes. lastly, add your basil, stir, and remove from heat. it will look like the picture below at this point. seeds and all… it will all get blended into a lovely healthful lunch or dinner in a few moments. taste the broth and adjust with more salt or pepper to your liking. working in two to three batches, carefully add some of this to your blender. ALWAYS USE CAUTION when blending hot liquids. only fill the blender 2/3 of the way full- and hold the lid on tightly with a large damp dishtowel as you blend. (trust me it will blow the lid right off any blender and spray your kitchen in an almost comical manner… I’ve been there.) 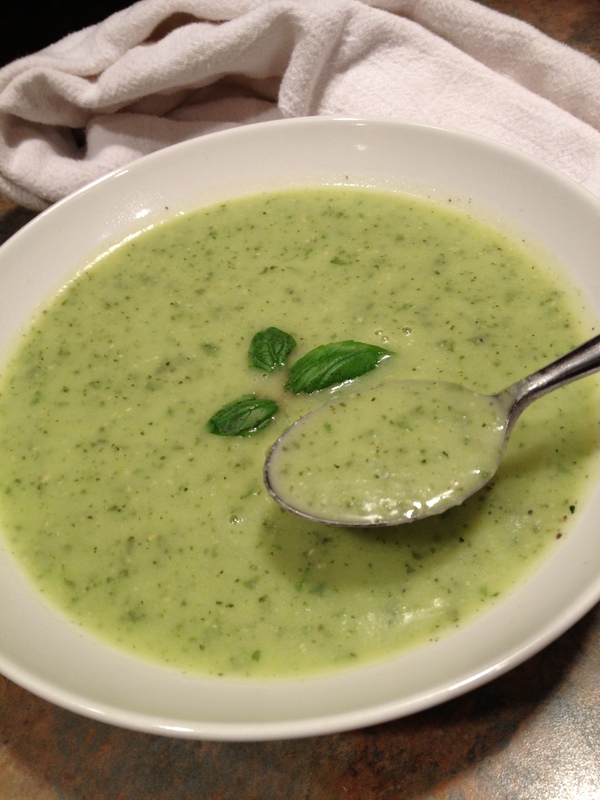 transfer blended soup to a nice serving bowl or even a Tupperware container. complete until all soup is blended, and serve how you see fit. i personally love it straight up… and love knowing exactly what is in it as I guiltlessly go for a second bowl. enjoy! 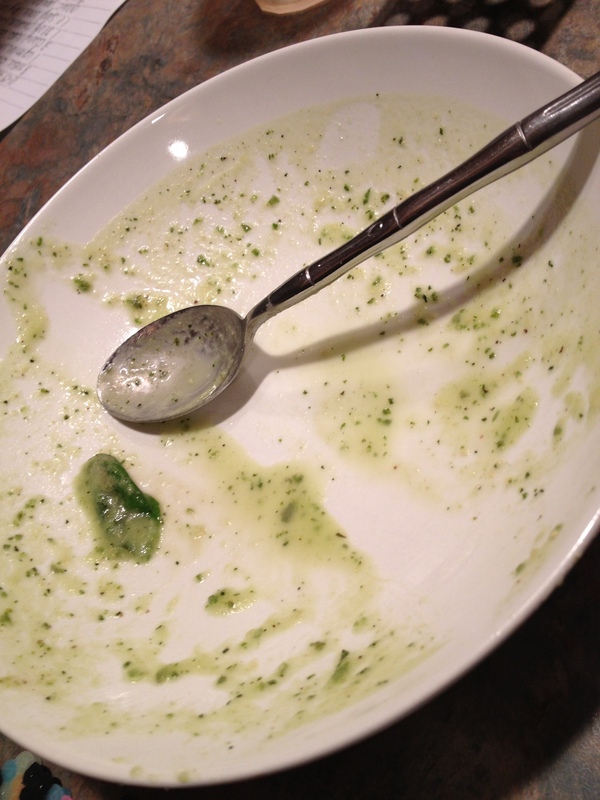 the picture below is the aftermath… and yes… that is my tongue path licking the bowl. Hey, it was a shallow bowl… it was asking for it.